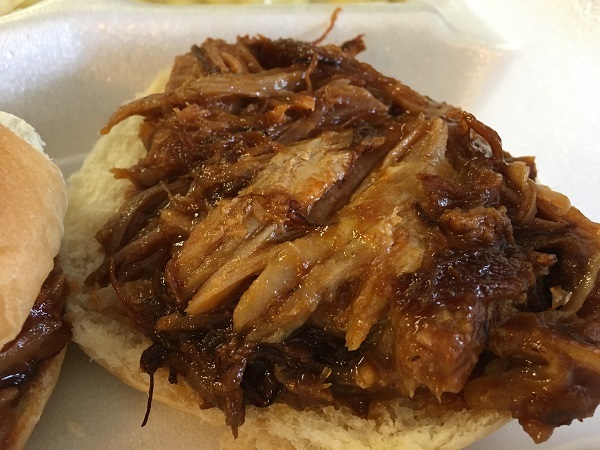 South Central Kentucky Barbecue – Marie, Let's Eat! 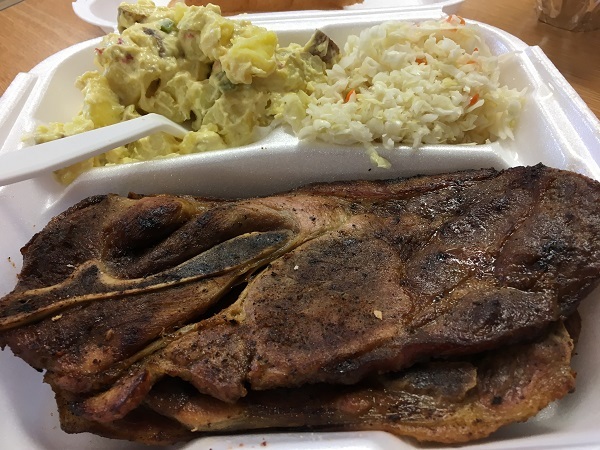 I wondered whether there might be any barbecue around Tompkinsville to sample after our meal at Dovie’s. Was there ever! The area is absolutely packed with small restaurants that offer a regional variation that I’ve never seen anywhere else. Several weeks ago, after I read about Dovie’s, I looked around and saw that there were some videos about the place. Some of these videos were from a Bowling Green KY station, WBKO, which has sent a food-loving reporter out to document all kinds of local restaurants. From here, I learned that there were a whole heck of a lot more barbecue restaurants in this region than I would have expected. I’ve mentioned previously that southeastern Tennessee is not at all like Georgia, where you pick a state highway and drive in any direction and you’ll find someplace to eat within half an hour. Here, there just aren’t very many middle-of-nowhere joints in the long gaps between towns. But Tompkinsville was, once, home to a surprising four barbecue joints itself, never mind all the state and county highways around it. I believe there are only three open today, which is still interesting; the population is only around 2400. I noted on Twitter that’s more, per capita, than Lexington NC, which is usually cited as having the most in any one city. That may be so, my pal Monk from the Barbecue Bros replied, but are Tompkinsville’s barbecue joints any good? Well, there’s only one way to find out. In a few south central Kentucky counties, the #1 meat by far is “shoulder,” which means a pork shoulder blade steak grilled over coals and sopped with a dip of vinegar, lard, black pepper, cayenne and other goodies. Barbecue places specializing in this style and cooking over coals get True ‘Cue certification. Nearly all of the barbecue places in this small region grill shoulder steaks, half chickens, pork chops, hamburgers, hot dogs and pork ribs over coals burned down from sticks of hickory. A few use manufactured charcoal. Purists might call this grilling instead of barbecue, but for south central Kentuckians that’s what barbecue is. 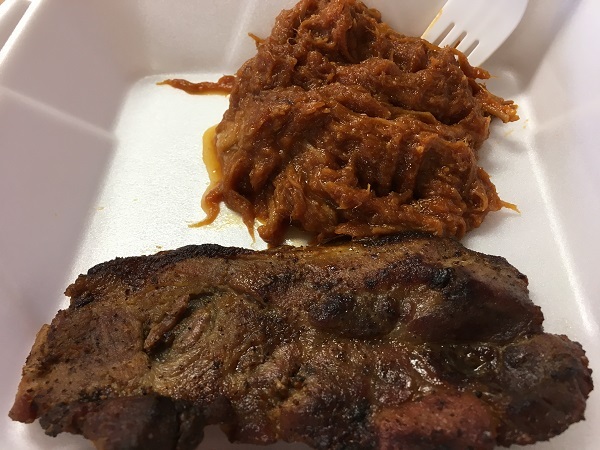 In Tompkinsville, we visited the amazingly popular Back Yard Barbeque and joined a long line snaking through the dining area to the order window. I told the girl that I’d never been here before and wasn’t sure what to order. She gave me absurdly generous samples of their shoulder and their shredded pork from which I could choose. I thought about it and ordered the shoulder with potato salad and slaw and received so much blasted food for only $7.99. Man alive, here’s what happens when you live in a region with a lower cost of living; your dollar buys an astonishing amount of food. Now, as for what I thought about this pork steak masquerading as barbecue: my opinion is irrelevant. I was reminded of the fascinating experience to be found in Gastonia NC, where R.O.’s and Black’s have been serving a minced, oven-cooked pork sandwich drowned in something more like Thousand Island dressing than anything else. This is not identikit competition barbecue, where the goal is to fit your smoked meat within a narrow window for the approval of some judge certified in ensuring that everything tastes the same. This is what the locals eat. This is what the locals love. This is authentic as food gets. No, I didn’t like it. I thought the shoulder meat was tough and dry. I was, however, completely fascinated by that hot sauce, which is a spicy, sweet and vinegary syrup, radioactive orange and utterly unlike any barbecue sauce I’ve ever seen. But who cares what I think? I don’t live here. The people that do are crazy about it. Their opinion is worth a thousand of mine. Just because I didn’t enjoy it doesn’t mean I’m not absolutely thrilled to have visited. I hope Back Yard and the other barbecue places around Tompkinsville stay open forever; anybody who loves finding local treasures and regional specialties needs to get up here and try this style. But as I learned, this style is not just confined to Tompkinsville. We made one other stop about thirty-four miles northeast in Burkesville. Going the way we did, using KY-214, takes you across Kentucky’s last remaining ferry, an absolutely delightful little detour along some very pretty roads and then the cute experience of having two fellows in a boat big enough for two cars shuttle you across the Cumberland River. Burkesville is even smaller than Tompkinsville; not too many people live in Cumberland County, but it’s home to Hamilton’s, a no-frills place which seems to keep pretty quiet, doing a little business in the shadow of the awesome-looking Alpine Motel high above the small town. Since I wasn’t all that taken with the shoulder at the previous stop, I ordered a shredded pork sandwich here, and was very pleasantly surprised. This was really good! Hamilton’s sauce had a similar vinegar flavor to what we’d tried earlier, but I enjoyed it a little more. The meat was very tasty. It’s usually been my experience that when you have meat simmering in the sauce, whether the middle Georgia style or the midlands Carolina way, it’s much more difficult to get the flavors of the meat to shine through the sauce. It’s not impossible, just more difficult. I never like it when the sauce overpowers the meat. This was just right. It was a very good sandwich. 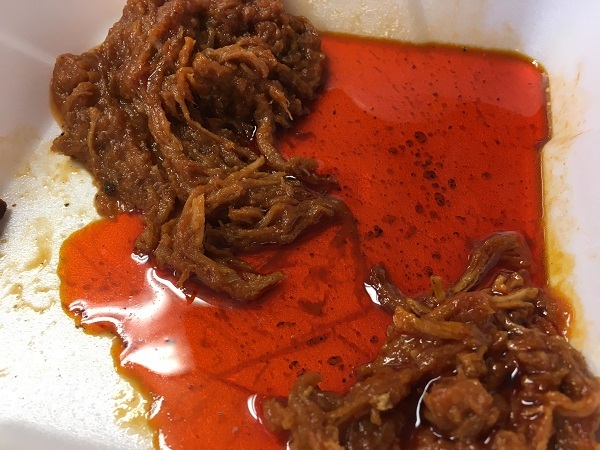 I spoke with the gentleman at the counter for a minute and he said that there may still be a few places in northern Tennessee, perhaps in Clay County, where this style of sauce, and the shoulder steaks, are still served. We might head that direction again before too much longer and try to learn a little more about the history of this interesting regional style. 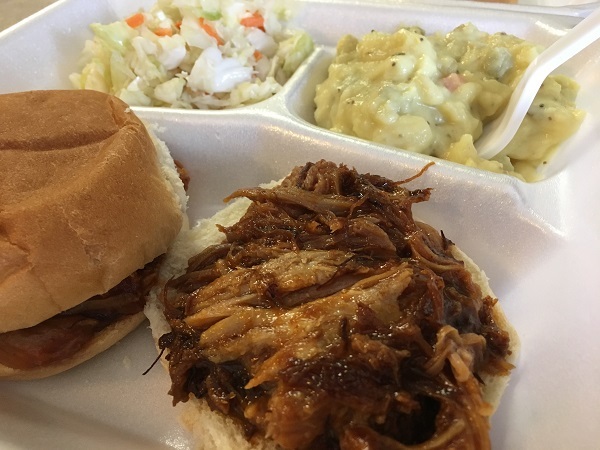 And in the meanwhile, we certainly encourage everybody curious about the variety and variations of barbecue to find time to come check out this part of the country, too! 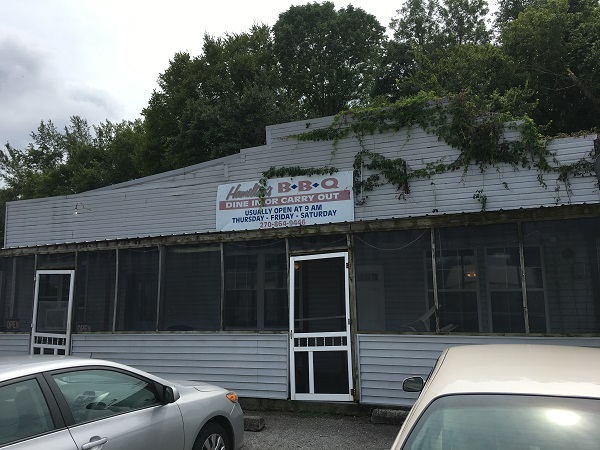 Posted on September 26, 2017 by Grant G.Posted in barbecue, kentuckyTagged barbecue, burkesville, kentucky, tompkinsville.